It’s time to seed your lawn and you’re about to head to the garden center to purchase your supplies for the project—grass seed, lawn fertilizer, and maybe a bale or two of wheat straw. Do yourself a favor and take note of exactly what it is you are buying. Not only does this make good economic sense, but you’ll also save yourself a lot of frustration in a few weeks when you discover that “bargain” bag of grass seed doesn’t grow much grass. One good way to learn more about your sack of grass seed is to read the seed tag and check on some basic information and numbers that reveal a lot about the contents. 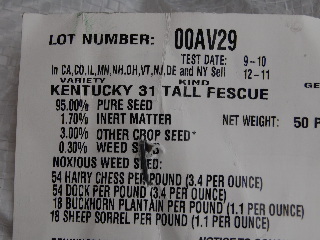 If you want to buy Kentucky 31 Fescue, check the seed tag to be sure that’s what’s in the bag. Some grass seed is packaged and sold under a catchy name that is intended to get your attention and help you visualize carpeted emerald grandeur—like maybe “Super Duper Blend Of Carpeted Emerald Grandeur Miracle Grass Seeds”! 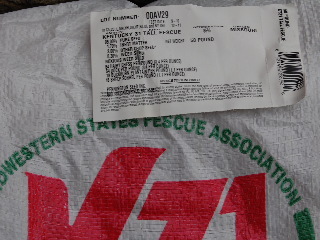 The more fantastic it sounds, the closer you should read the seed tag (or in some instances, the information on the bag itself). Some blends may have a big price and a catchy name, and yet be a high percentage of annual rye. Rye is relatively inexpensive and will germinate quickly in cool weather, but will burn out and die in a few months as the weather warms. Let’s look at one of the most important pieces of information on the seed tag right off the bat—the “test date”. Pretty self explanatory—when did they check on the viability of the seeds in the bag? The more recent, the better, of course. If the test date is more than 6 or 7 months ago, be leery. “Pure seed” is the percentage of the seeds that appear to be sound (not broken or damaged) and would thus be viable and expected to germinate. The higher this number is, the better. “Inert matter” is extraneous material in the seed sample such as dirt, sand, rocks, trash, or anything else other than seed. The lower this number is, the better. “Weed seed” may be viable seeds that will germinate and grow—they’re just not going to grow the kind of grass you’re hoping for. Once again, the lower this number is, the better for you. To me, it’s actually reassuring to see all these numbers on the seed tag. It helps me know that, even though the bag of grass seed I am buying may not be perfect, at least it has been tested and I know what I’m paying for. So the next time you see an advertisement for some grand and mystical grass seed, look closely at exactly what it is you’ll be getting—read that seed tag!